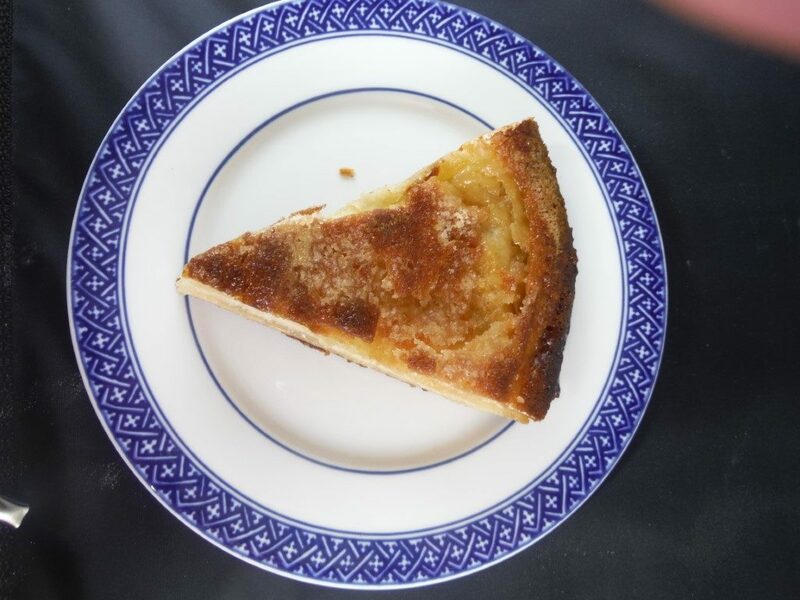 This simplified version of a classic cake from Brittany originated in Jeffrey Alford and Naomi Duguid’s book Home Baking: The Artful Mix of Flour and Tradition Around the World, as further refined by Food and Wine magazine, and then as I further adapted it. I made it the first time per the recipe with store-bought pizza dough (from Publix) although I found that the Publix dough was not very extensible, which made rolling out the dough a challenge. 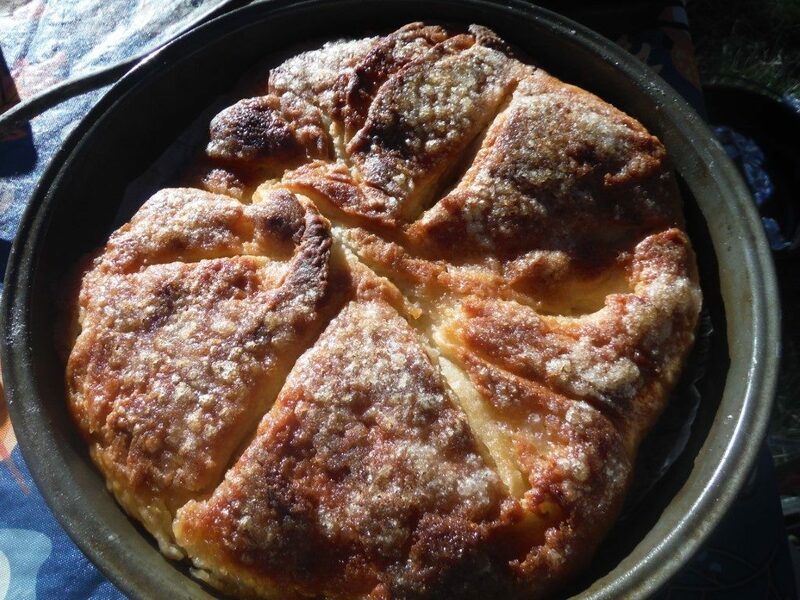 Nonetheless, the final product was very tasty, even if it does not look like much, which is amazing since all it consists of is bread dough, butter, and sugar. Divide the chilled butter into 16 pats. Further divide each of the pats into quarters, so that there are 64 pieces. Scatter 20 of the butter pieces over 2/3 of the surface of the dough and sprinkle the same area with ¼ cup of sugar. Fold the naked third of the dough over half of the butter/sugar covered dough, and then fold the remaining third on top, creating three layers. Rotate the dough 90 degrees, lightly flour the top and roll the dough into a rectangle for the second time. Again scatter 20 of the butter pieces over 2/3 of the surface of the dough and sprinkle the same area with ¼ cup of sugar. Fold the naked third of the dough over half of the butter/sugar covered dough, and then fold the remaining third on top, so that now there are 9 layers. 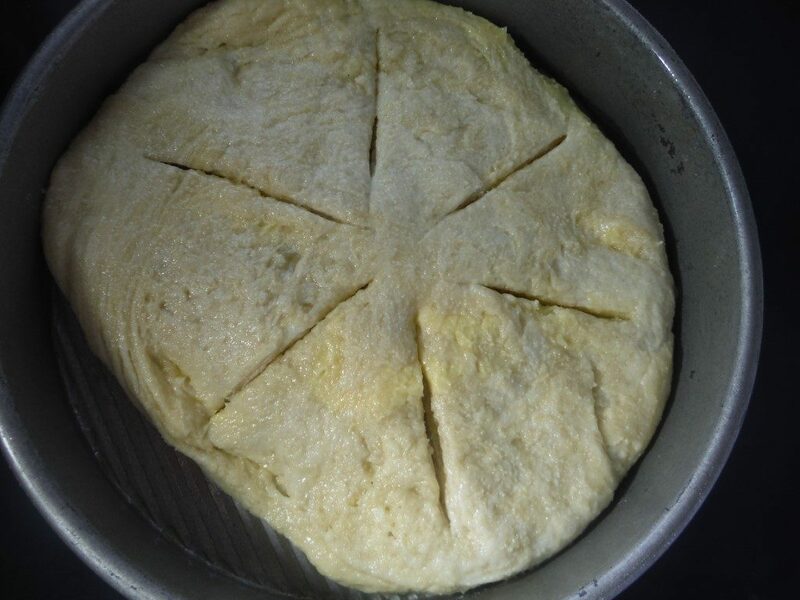 Rotate the dough 90 degrees, lightly flour the top and roll the dough into a rectangle for the third time. Now scatter the last 24 butter pieces over 2/3 of the surface of the dough and sprinkle the same area with ¼ cup of sugar. Fold the naked third of the dough over half of the butter/sugar covered dough, and then fold the remaining third on top, so that now there are 27 layers. 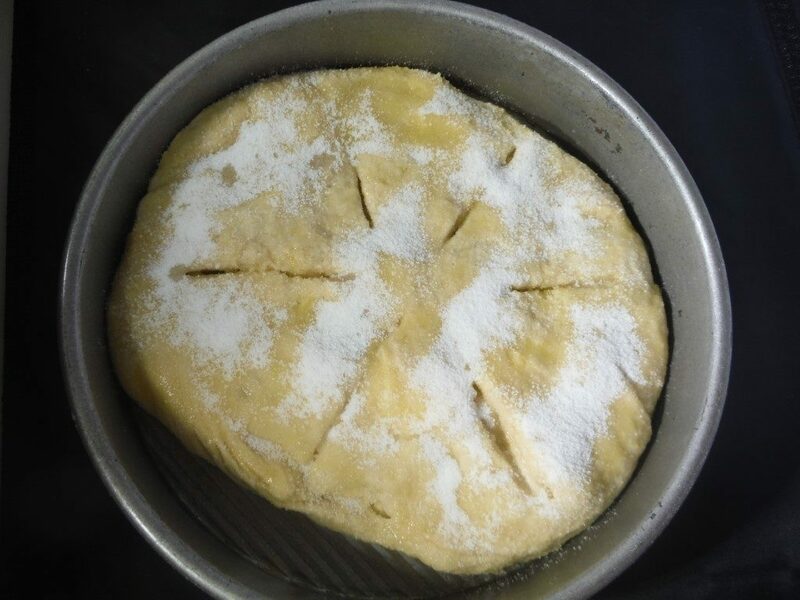 Grease a 9 inch cake pan, and insert the dough into the cake pan, folding the dough under as needed to put the rectangle of dough into a round pan. Cut 6 slits 2 inches long fully through the layers of the dough in a star pattern. Cover and allow to rise for 45 minutes while the oven warms up. Brush the top with the tablespoon of melted butter and sprinkle with the remaining 2 tablespoons of sugar. The cake will be best the day it is made.